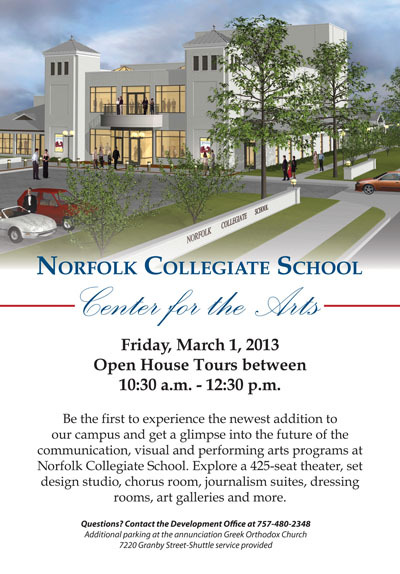 Norfolk Collegiate will be holding an Open House on March 1, 2013 between 10:30am and 12:30pm to show off their brand new Center for the Arts. This is open to the public and the Wards Corner community is encouraged to attend. This entry was posted on Tuesday, February 26th, 2013 at 9:16 am and is filed under economic development. You can follow any responses to this entry through the RSS 2.0 feed. Both comments and pings are currently closed. I live across the street from Norfolk Collegiate; it was amazing to see a pile a dirt, lumber, bricks, and mortar being transformed into this beautiful facility. It will definitely add to rebirth of the corridor.